‘Hayter of the Bourgeoisie’, by Teresa Hayter. Sidgwick and Jackson. £1.95. This book is written by the daughter of the one-time British Ambassador to Moscow, Sir William Hayter. The first few chapters are an account of her personal history (childhood, education, etc.) leading on to her work with the Overseas Development Institute. While with the ODI she visited various parts of the underdeveloped world and saw at first hand the poverty and misery there and which contributed to her growing “politicization”. During her stay in the third world she came to the conclusion that the cause of all this backwardness was the dominance over the economy and the local politicians by the “imperialist” nations (America, Britain, France, etc.) and that the so-called aid programmes were really another form of imperialism in that they bound the third world nations more securely to the economies of the western exploiters. Thus she came to write a book on the activities in this connection of the World Bank in Latin America. The ODI refused to publish this and it was subsequently published by Penguin as Aid as Imperialism. As a result of all these experiences Hayter jettisoned her liberal fallacies and became a “revolutionary”. Alas, all this means is that she has embraced all the old Bolshevik fallacies instead and has joined the Trotskyist IMG (International Marxist Group). The blurb on the dust jacket tells us that Hayter’s current ideas were formed through identifying with the third world. This is nothing new for Trotskyists since, basically, they are trying to fulfil the historic task of the bourgeoisie ( the completion of the capitalist revolution) in those parts of the world where the bourgeoisie are too weak to do it themselves. Hayter and the IMG support all “national liberation” movements on the assumption that national liberation will weaken the imperialist nationals, cause a major economic breakdown, and so precipitate the working class into revolution. Leaving aside the absurdity that a frightened, politically working class will opt for Socialism (more likely to support reaction as in Germany in 1933) we should point that the author has devoted part of this book and all of Aid as Imperialism to showing that exploitation continues in other forms after independence anyway! And even if America loses all influence in, say, Vietnam does she think that the vacuum will remain unfilled by some other imperialist power, perhaps Russia or China? Indeed, when French interests were kicked out of the Far East after the second world war all that happened was that America moved in instead. When dealing with the Russian revolution Hayter displays either a remarkable capacity for naivety or downright dishonesty. She claims “In Russia Soviet democracy survived longest in the areas where the Bolshevik (later Communist) Party was strong” and mentions Lenin arguing that “workers’ councils must be set up everywhere, whether or not there were members of the Communist Party”. In fact exactly the opposite happened. The Bolsheviks closed down trade union and peasant bodies which they couldn’t control, shot down people who demanded that unpopular Bolshevik-dominated soviets should be subject to recall, and dissolved the democratically elected Constituent Assembly which Lenin had been clamouring for until it failed to produce anything like the anticipated Bolshevik majority. Trotskyists, Hayter included, are fond of the theory that the revolution only degenerated with the coming of Stalin and that the Communist Party had hitherto practised “democratic centralism”—democracy within the Party (even if nowhere else). Indeed, during the wrangles between Stalin and Trotsky over the throne vacated by Lenin, Trotsky, the dazzling intellectual, complained that Stalin was suppressing his views; but Stalin, the plodder, simply ran rings round Trotsky by pointing out that he had never complained when other opposition groups had been suppressed at the Tenth Party Congress in 1921. Both Lenin and Trotsky turned a blind eye to murders committed by Bolsheviks and to the packing of factory meetings and soviets by Bolsheviks who had no right to be there. And it was Lenin, not Stalin, who introduced the dreaded Cheka which Hayter rightly calls “an abominable abuse of everything that Marxism stands for”. The truth is that “degeneration” began straight away since Lenin and the whole Bolshevik theory could allow nothing less than a complete dictatorship over the proletariat. Although Hayter criticises the “Great Man” theory of history at Oxford she seems to have swallowed it herself. How else can we explain her claim that the “revolution” in Kenya failed because of the treachery of one man, Jomo Kenyatta? And in France in May 1968, again everything hinges on the leaders . . . if only they had been Trotskyists instead of the traitorous Stalinists. She also has some strange notions about economics although this may be due to her determination to see heaven on Earth in Cuba. She actually claims that money is becoming unimportant there, because, owing to the widespread scarcity, no one can buy much anyway! All this is bad enough, but when she turns her attention to what life will be like “after the revolution” (which she thinks she will be achieved at the barricades with guns and petrol bombs) then she really goes haywire. She correctly points out that the Left is always reluctant to describe what it means by Communism, so she sets out to redress this need. Apparently society will be run by workers’ councils and not by the latter-day Bolsheviks. In case the reader is worried by what happened in Russia she hints that because Britain has “relatively democratic traditions” (which Trots have always said are a sham) then there should be little post-revolutionary violence. But the whole population will have to be armed. Whatever for? To ensure that the capitalists don’t stage a comeback! What supermen the left make these capitalists out to be. 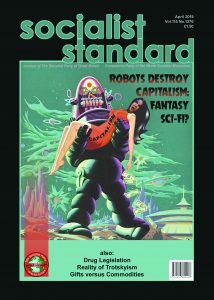 Despite the abundance of technical and natural resources which mankind now has at its disposal, we are told that the abolition of exchange relationships and the introduction of production for use is “a remote ideal” so the wages system (rationing) must continue with, in good Leninist tradition, equal wages for all. 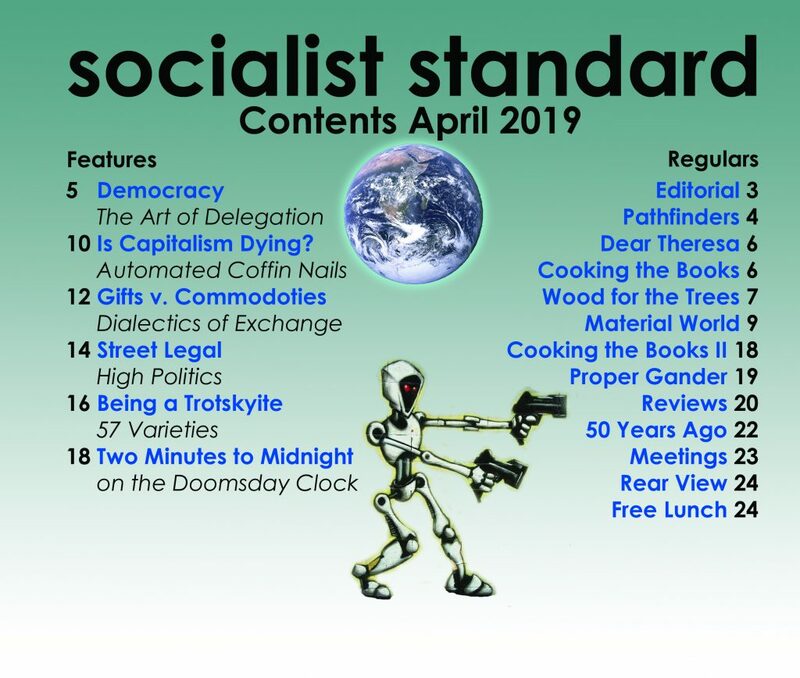 Perhaps it is just as well that the Left don’t try to describe Socialism more often, There’s enough confusion on that score already. Hayter’s book is nevertheless a good buy for anyone who wants to have just about every error in the Trotskyist repertoire conveniently placed between two covers.